–Maurice Manning — Author, Lawrence Booth’s Book of Visions, Bucolics, The Common Man (finalist for the Pulitzer Prize in poetry), and The Gone and the Going Away. –Jane Hicks — Author, Blood & Bone Remember (Appalachian Writers Association, 2006 Book of the Year) and Driving With the Dead (Appalachian Writers Association, 2015 Book of the Year). Larry Thacker’s poems set about the difficult business of reconciling the seemingly irreconcilable: death & life, darkness & light, summer & winter, distant histories & the yet-to-be. As yet, somehow, he succeeds. Perhaps the secret is in the tenderness of Thacker’s attention, for these poems have as much regard for the dried-up earthworms on the sidewalk as they do for the spiraling arms of our galaxy, and they are both unapologetically masculine and unsentimentally affectionate. As much the child of Jack Gilbert as Ted Hughes, Larry Thacker is a poet in love with the world – warts and all – and in Drifting in Awe, he convinces us to love it, too. Order Drifting in Awe from Finishing Line Press or from the author. Order Memory Train from Finishing Line Press, Amazon, and the Author. Contact the author at mountainfocusart@gmail.com for reading and signing events. 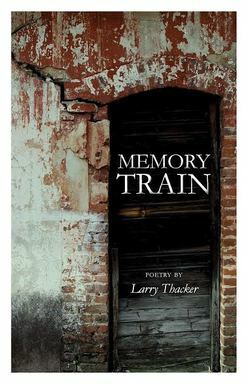 Memory Train, a collection of poems by regional author and artist Larry D. Thacker, travels an extensive range of internal and external emotions, threading in elements of life and death, using the language of landscape, reaching out for the natural world we can see and mysterious worlds that escape our understanding. This is a journeying collection. As a seventh-generation Cumberland Gap are native, Thacker’s writing over the years – whether through columns, fiction, or poetry – has served as a cultural balm of sorts, helping him, and hopefully others, better understand the history of the Appalachian experience and our place in that ever-changing landscape. This is Thacker’s second book of poetry, his first being Voice Hunting, published in 2011 (Finishing Line Press) as well as Mountain Mysteries: The Mystic Traditions of Appalachia (2007, Overmountain Press). His opinion column, Mountain Musings, was a regular feature of the Middlesboro Daily News for a number of years and he had blogged for a time with the Seattle Post-Intelligencer. He is founder of the community writers group, Creek Side Writers. The group meets each Thursday at the Gap Creek Coffee House in Cumberland Gap, and everyone is invited. Thacker and his wife, Karin, split their time these days between his hometown of Middlesboro, Kentucky and their home in Johnson City, Tennessee. Larry Thacker has written a set of poems so rich and muscular in its music that readers will think of the best of Ted Hughes, or of early Seamus Heaney. The poems in Memory Train convince us that they are inevitable as the forces that drive people into action. The voices here search for truth, and for understanding, “addicted to the night/-dream of making sense of it all,” as one poem calls it. Thacker reminds us how to love the difficult places we come from, and how to live there in the real present, not a misty-eyed version of the past. We are given the world as it is, for better or for worse, and Larry Thacker has turned it into a song that will stick in my memory for a long time. In Memory Train, Larry Thacker’s voice veers from the gothic into the romantic, from realism into naturalism, from telescoped metaphors to the hard, blunted truth. His language amplifies the quotidian—but more than that, his poems never squint away from the bright realities of danger and blood, of shadows cast through the lens of narrators who not only accept what is butmake it. His poems have a way of distancing the reader and then pulling them in close—a voice confident, unafraid, and lambent with intelligence. In “A rainstorm’s first notes,” the narrator sees vines in the garden “thickened / on a phone pole / shaped up / out like / a crucified body, a hanging watch, / leafy conductor.” Full of Dickinsonian layers and a language often as ecstatic as Dylan Thomas, Larry Thacker’s new collection is one I will read again and again not merely for chances to delight in its language, but for the wisdom thrumming through nearly every line. Larry Thacker as poet practices a kind of "Appalachian alchemy" as he searches for the poetic elixir that will turn our eyes and ears from the commonplace to the unexpected. His poems are hymns to birth and death, psalms for the seasons, and lamentations for the environmental destruction that wrecks his mountain homeland...He probes the "mythic dark matter" of Appalachia with new rhythms, "hunting the warm memories" as he "whispers and sings the secrets" of his birthplace. What a magical power he brings to these debut poems - and alchemist indeed. All the poems in Larry Thacker's chapbook...have their throats cut, their truth pouring out like last words. The immediacy in these poems reminds me of the work of Dave Smith, especially their mythic sense of place and zeniths of experience. This collection abounds with admirable qualities. I recommend it to all who have a love of the lives and sensibilities of a very special place, Appalachia. Voice Hunting chronicles a Generation X Appalachian's search for identity. In a world where television homogenizes culture, Thacker examines the duality of his generation. Clearly identifying with many ways of his ancestors, Thacker speaks out about the atrocities of mountaintop removal and environmental destruction that not only destroy landscape but culture. The poems are moving and uplifting and the found voice is one worth hearing.